Quickie Darling Deal & Steal: Fast Food Makes For Fast Fashion! I’ve hit a recent road bump in terms of blogging. My precious laptop has self-destructed & I’m very thankful to be working on a loaner computer, which means that I’m without some of my valued resources in terms of presenting images here, but I’m making due. With this, I’ve also found myself intrigued by the idea of sharing unconventional ideas using limited technology. Anyway… I’d like to bring up the idea of fast food & fashion. When I took on a second job with less than pleasing hours, I knew I’d be hitting the drive-up more often than not, but now that I have a routine for myself, I’m steering clear of unhealthy foods for my meals. However, among Forever 21‘s newest arrivals there’s a trend happening that I’m not sure about, which is why I’m bringing it to my readers’ attention. 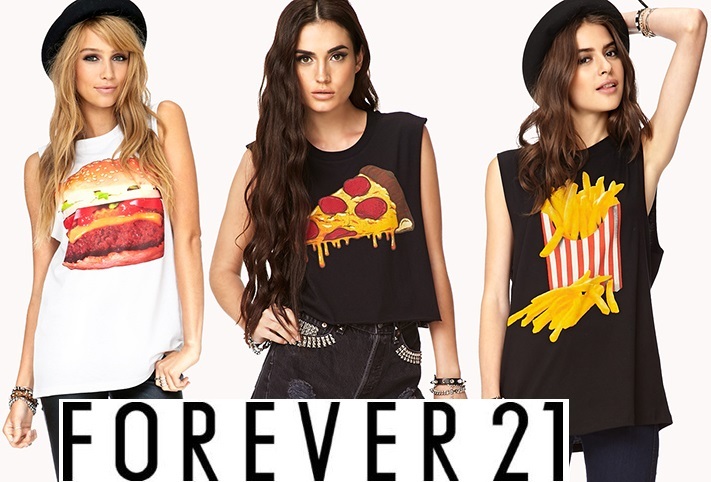 Surely, there’s a certain demographic that can get away with tops like these, hence why they’re perfect for Forever 21. The fun hamburger muscle tee ($12.80), cheesy cropped muscle tee ($12.80), & French fries muscle tee ($13.80) are all things casual to wear with jeggings & a boyfriend blazer, a leather mini skirt & platform slingbacks, as well as with skinny pants & a knit cardigan. I love to a good graphic tee, but my style calls for something feminine, perhaps with some metallic element, a nod to Paris or shoe shopping, or embellished with ribbons or rhinestones so that I can dress up an army green cargo skirt or get a chic daytime look out of printed jeans. However, how do you feel about the designs on these tees? Do fashion & food work together? For more posts on affordable fashion, check out previous posts including my favorite new shoes from H&M, a fall-ready polka dot backpack, the Downton Abbey beauty collection, & the latest lookbook from Lauren Conrad’s Kohl’s collection! Happy Styling! This entry was posted in Quickie Darling Deal & Steal, Style Darling Daily and tagged affordable fashion, Forever 21, graphic tee, muscle tee, Quickie Darling Deal & Steal, shopping. Bookmark the permalink. ← Top 10 Celeb Sightings: LBDs, Florals, & Structured Polish From Jennifer Aniston, Diane Kruger, Selena Gomez, & More!